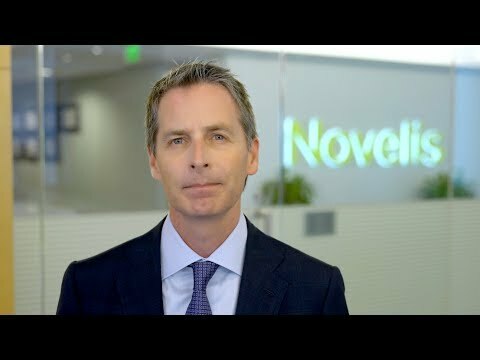 ATLANTA, July 26, 2018 /PRNewswire/ -- Novelis Inc., the world leader in aluminum rolling and recycling, today announced it has signed a definitive agreement to acquire Aleris Corporation, a global supplier of rolled aluminum products, for approximately $2.6 billion including the assumption of debt. Establishing a more diverse product portfolio, including aerospace, beverage can, automotive, building and construction, commercial transportation and specialty products. Integrating complementary assets in Asia to include recycling, casting, rolling and finishing capabilities and allowing Novelis to more efficiently serve the growing Asia market. Broadening Novelis' automotive business to meet growing demand and diversifying its global footprint and customer base. Strengthening ability to compete against steel by gaining a greater platform for production, innovation and service. Executing a fully debt funded deal with leverage forecasted to peak below 4x at closing, and return to 3x in approximately two years. "Acquiring Aleris is the right opportunity at the right time as they are set for transformational growth," said Steve Fisher, President and CEO, Novelis Inc. "The significant investments they've made in the high-demand, high-value aerospace and automotive segments have resulted in favorable long-term, global contracts. These investments, coupled with a diverse and talented workforce, will add tremendous value to our organization and allow us to deliver the highest quality innovative aluminum solutions to our customers." Over the past several years, Novelis has successfully brought online $2 billion in production assets by utilizing its best-in-class manufacturing expertise in rolling and finishing. This proven track record of safely and efficiently ramping up assets along with our collective expertise will enable Novelis to enhance Aleris' operations, while continuing to deliver innovative solutions that meet customers' needs and drive shareholder value. As part of the acquisition, Novelis will acquire Aleris' 13 manufacturing facilities across North America, Asia and Europe. Aleris' new automotive finishing lines in Lewisport, Kentucky, of which a significant amount of its 200kt capacity is already under contract, along with 100kt of auto capacity in Duffel, Belgium, will allow Novelis to further diversify its global footprint and customer base. In addition, Aleris' Zhenjiang facility is strategically located near Novelis' existing Changzhou plant, adding value through logistical efficiencies, closed-loop recycling, and providing greater opportunity for customer collaboration. "With the support of our private equity owners, our Aleris team has done an excellent job of implementing our company's strategic transformation over the past several years. By enhancing our capabilities to serve our customers in high-value industries, we have significantly increased the value of the company," Sean Stack, Aleris chairman and CEO said. "I am confident that our assets and people will continue to thrive and contribute to Novelis' future success." "Our focus on keeping a disciplined balance sheet will continue," said Devinder Ahuja, Senior Vice President and Chief Financial Officer of Novelis. "The pro forma net debt to Adjusted EBITDA is forecasted to peak below 4x at closing, and return to 3x in approximately two years." Novelis will discuss this transaction via a live webcast and conference call for its debt investors at 12:30 p.m. EDT on Thursday, July 26, 2018. To view slides and participate in listen-only mode, visit the web at https://cc.callinfo.com/r/1530u0clfeoxe&eom. To join by telephone, dial toll-free in North America at 877 243 0931, India toll-free at 18002660836 or the international toll line at +1 212 231 2921. Presentation materials can be found at novelis.com/investors. Hindalco will be hosting a conference call for its equity analysts and investors at 10:30 a.m. EDT the same day. To join by telephone, dial US toll free 866 746 2133, or international toll line +91 22 6280 1303. Novelis' financial advisor is Goldman Sachs & Co. LLC, and its legal advisor is Latham & Watkins LLP. Aleris' financial advisor is Moelis & Co., and its legal advisor is Fried, Frank, Harris, Shriver & Jacobson LLP. Additionally, Deutsche Bank Securities Inc. advised the Aleris Board on certain matters. For more information, please visit novelis.com. Novelis Inc. is the global leader in aluminum rolled products and the world's largest recycler of aluminum. The company is headquartered in Atlanta, Georgia, operates in 10 countries, has approximately 11,000 employees and had $11.5 billion in revenue for its 2018 fiscal year. Novelis supplies premium aluminum sheet and foil products to transportation, packaging, construction, industrial and consumer electronics markets throughout North America, Europe, Asia and South America. Novelis is a subsidiary of Hindalco Industries Limited, an industry leader in aluminum and copper, and metals flagship company of the Aditya Birla Group, a multinational conglomerate based in Mumbai, India. For more information, visit novelis.com and follow us on Facebook at facebook.com/NovelisInc and Twitter at twitter.com/Novelis. Aleris is a privately held, global leader in aluminum rolled products production, with approximately $3 billion in annual revenue and 5,400 employees. Headquartered in Cleveland, Ohio, Aleris operates 13 production facilities in North America, Europe and Asia. For more information, visit www.aleris.com. Statements made in this news release which describe Novelis' intentions, expectations, beliefs or predictions may be forward-looking statements within the meaning of securities laws. Forward-looking statements include statements preceded by, followed by, or including the words "believes," "expects," "anticipates," "plans," "estimates," "projects," "forecasts," or similar expressions. Examples of forward looking statements in this news release are statements concerning forecasts of combined pro forma revenues and peak net debt to Adjusted EBITDA. Novelis cautions that, by their nature, forward-looking statements involve risk and uncertainty and Novelis' actual results could differ materially from those expressed or implied in such statements. We do not intend, and we disclaim any obligation, to update any forward-looking statements, whether as a result of new information, future events or otherwise. Factors that could cause actual results or outcomes to differ from the results expressed or implied by forward-looking statements include, among other things: changes in the prices and availability of aluminum (or premiums associated with such prices) or other materials and raw materials we use; the capacity and effectiveness of our hedging activities; relationships with, and financial and operating conditions of, our customers, suppliers and other stakeholders; fluctuations in the supply of, and prices for, energy in the areas in which we maintain production facilities; our ability to access financing for future capital requirements; changes in the relative values of various currencies and the effectiveness of our currency hedging activities; factors affecting our operations, such as litigation, environmental remediation and clean-up costs, labor relations and negotiations, breakdown of equipment and other events; economic, regulatory and political factors within the countries in which we operate or sell our products, including changes in duties or tariffs; competition from other aluminum rolled products producers as well as from substitute materials such as steel, glass, plastic and composite materials; changes in general economic conditions including deterioration in the global economy, particularly sectors in which our customers operate; changes in government regulations, particularly those affecting taxes, derivative instruments, environmental, health or safety compliance; changes in interest rates that have the effect of increasing the amounts we pay under our credit facilities and other financing agreements; the effect of taxes and changes in tax rates; and our ability to generate cash. The above list of factors is not exhaustive. Other important risk factors are included under the caption "Risk Factors" in our Annual Report on Form 10-K for the fiscal year ended March 31, 2018.